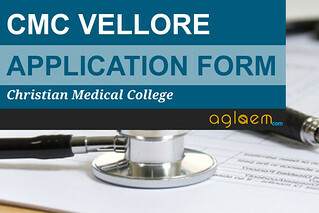 Home Medical CMC Vellore CMC Vellore Application Form 2019 – Available! Candidates can fill CMC Vellore Application Form 2019 online from the direct link which is provided below. Application form of CMC Vellore 2019 is available now. The online application form for CMC Vellore except MBBS has started from February 14, 2019. Candidates who are eligible for Group A ( MBBS, BSc Nursing, Allied Health Sciences (AHS ) Degree courses), Group B (Diploma Nursing, AHS Diploma courses, MPH and MSc courses) and PG Diploma Course admissions, can apply. Admit card of CMC Vellore 2019 entrance exam will be issued to applicants as per schedule after form submission process is completed. Get here complete details of CMC Vellore 2019 Application Form such as how to apply, application fee, and step by step procedure. Latest: CMC Vellore Application Form 2019 has been released. Scroll down to apply online links are provided below. Interested candidates can apply online for admission to various Group A, Group B and PG Diploma Course. Before filing the application form interested candidate must ensure their eligibility. Online submission of NEET UG 2019 score (only for MBBS applicants) To be announced! Online submission of ARNo and rank of TN management quota rank list 2019 (only for MBBS applicants) To be announced! Physical Counselling by Tamil Nadu selection committee, DME, Chennai (only for MBBS applicants) To be announced! Note: MBBS applicants have to submit their NEET (UG)-2019 marks at our website. All India rank and roll number and their (b) ARNo and rank of TN management quota rank list 2019 for MBBS admission in self-financing medical colleges. Apply Online: Candidates can apply online for the CMC Vellore Admission 2019 from the below links. Candidates can pay the application fee through the challan. No extra cost for Challan at any branch of ICICI bank in India. Candidates can make the online payment through the Credit Card/ Debit Card/ Net Banking. Specification for photograph: Recent colour passport size photograph taken after 1st February this year, light background, JPEG format not exceeding 80 KB (Width – 150 pixels & Height – 150 pixels). Please note the Application Number on your Form. Quote this for any enquiry that you may have and when communicating in all further correspondence with the Registrar’s Office. As a challan at no extra cost at any branch of ICICI bank in India. A challan will be generated when filling payment details in the application form. Please mention FC-CMC-V on the challan. Send the original challan to this office before April 02, 2019. Applications received without the application fee as mentioned above will not be registered. Foreign Nationals and Applicants from Abroad: Those residents abroad, including SAARC countries, will have to pay a different fee for Registration. This may be sent in INR or equivalent currency payable at Vellore as described earlier. Copy (not original) of Community/caste certificate, duly signed by Dy. Tahsildar or District Magistrate. If the certificate is not in English, an attested English Translation should be attached. Application form for Undergraduate College Sponsorship for Christians along with required enclosures/certificates. Application form for College of Nursing Sponsorship along with required enclosures/certificates. Enclosures may be sent separately with the Application number clearly mentioned. Enclosures received without this number or after the last date for submission will not be accepted. Academic or extracurricular certificates should not be enclosed. The information provided in the Application Form will be taken as final. No changes will be permitted at later stages. Take a print out of the completed application form and the application confirmation page for your reference. (Do not send a hard copy of your application form to the Registrar’s Office). Send the proof of payment (ICICI challan payment) and all the other required ENCLOSURES where applicable to the Office of the Registrar, CMC, Vellore 632002 to reach not later than the last dates specified. An email stating successful registration of the application will be sent to the candidates within a week of final submission of the application. If not received, please check with this office by email. Please keep your application number as user name and date of birth as password to download your hall ticket from the website. Anybody requiring assistance for filling the application form online may contact the Registrar’s office in person. Sir please send counselling date for me.